The group arrived in Bangkok after the twelve hour overnight flight from Heathrow and we were immediately hit by the heat and humidity before being picked up by our mini bus and braving the notorious Bangkok traffic it took an hour and a half to our hotel (we found out later that the sky train link would take half an hour). Bangkok is ideal to visit for three or four nights with its chaotic street markets, there are day and night and markets and floating one's on the canals. We visited all of these and walked through China town to the vast flower market with it's sweet smells and heady aromas, we saw garlands being made. We travelled along the Chao Praya River by motorboat seeing people who live along the river and visited the Royal Barge museum and Temple of Dawn (Wat Arun). Bangkok was known as Venice of the east. We rode on a Tuk Tuk around Bangkok this is a must and saw the famous Hua Lampong railway station. There are modern shopping centres and we felt safe walking around on our own in small groups in the hustle and bustle but you still must be careful and sensible as you would be in a capital city. The lack of poverty was noticeable and remarked upon. The only sight we missed was going inside the Grand Palace we drove passed it on the Tuc Tuc. I'll have to go back later. and of course Hua Hin's night market. Famous Bridge over the River Quay this was very impressive and you could still see some off the original pillars with bomb markings in them, the bridge has been very well restored and you can walk all the way across. 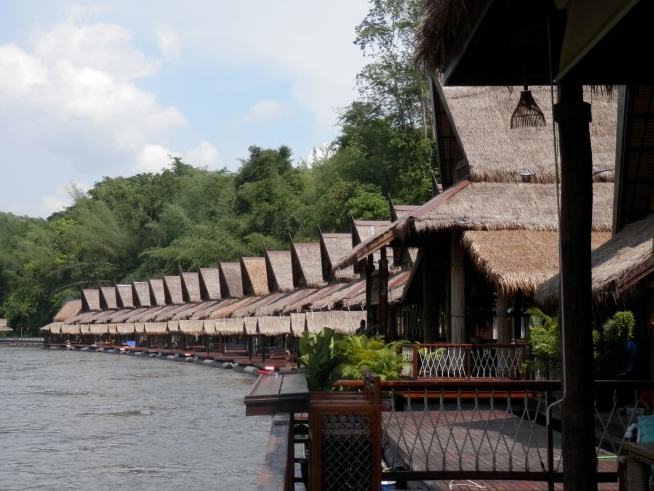 We drove on up river for twenty minutes then boarded a long- tailed boat on the River Kwai to the Float house these are a group of wooden lodges floating on the river, staying one night was a experience as the lodges swayed on the current and once you got on dry land you still moved very much like a cruise ship. In the afternoon and evening we visited the nearby Mon tribal village they are from Burma and live in Thailand awaiting citizenship and saw them dance in the evening. Prisoners surviving. Visiting the museum was emotional but very well done. In the afternoon we took a train ride on Death Railway passing over a wooden viaduct constructed by the Allied POWs, this was a memorable experience.